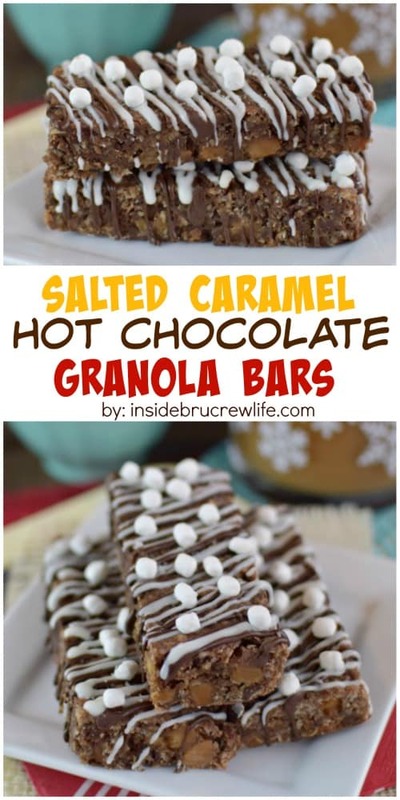 Try these Salted Caramel Hot Chocolate Granola Bars for a fun on the go breakfast option. 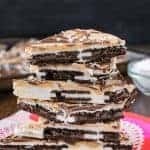 The extra chocolate drizzles, mini marshmallows, and sea salt totally make these look like your favorite hot chocolate drink. *Like these recipes? Be sure to sign up for the BruCrew email to have new recipes delivered to your inbox. I have decided that I will never ever get tired of salted caramel. 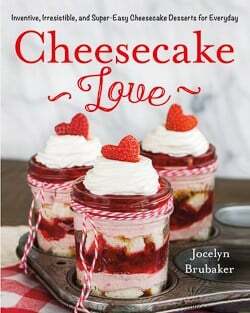 It’s a food trend that I have completely and whole heartedly fallen in love with. Yup, it’s here to stay. 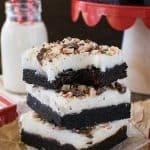 A few years ago I made these Raspberry Hot Chocolate Bars, and they were great. But this time I wanted to change them up with some caramel and sea salt. Like I said, I just can’t stop! Homemade granola bars are so easy to make. Now don’t get me wrong, we still buy boxes of store bought ones too. Convenience does win out sometimes. After the bars finish baking and cooling, you are going to cut them into 16 bars. 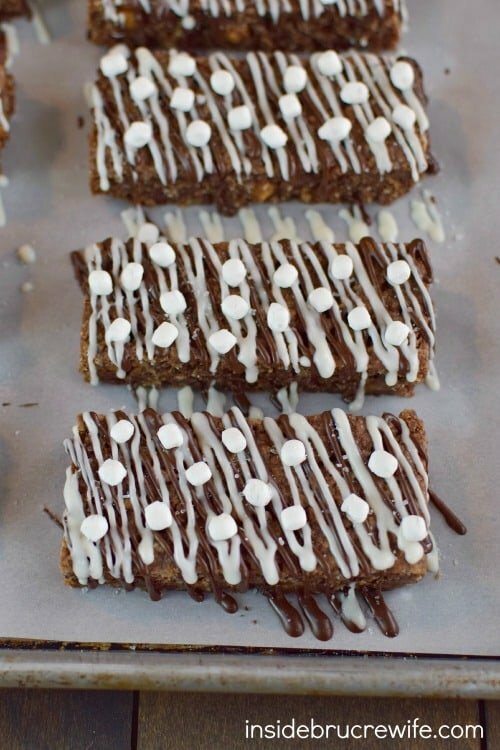 Then melt some chocolate chips and white chocolate chips in the microwave and drizzle over every bar. You can spoon the melted chocolate into a small Ziplock bag and cut one corner off. 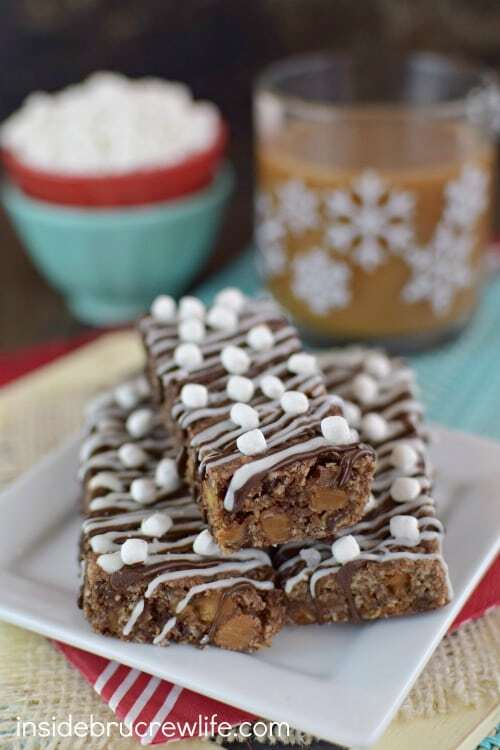 Drizzle quickly so you can sprinkle on the sea salt and marshmallows before the chocolate sets. Here is a quick baking tip for you. If your chocolate does set up before you can sprinkle the fun extras on, get your blow dryer out! Yup, you read that right. Heat up the chocolate with the lowest setting on your dryer. When the chocolate is melted, sprinkle away with your goodness. Let them set and then grab one with your coffee and some Salted Caramel Mocha Creamer, and you are ready for the day! 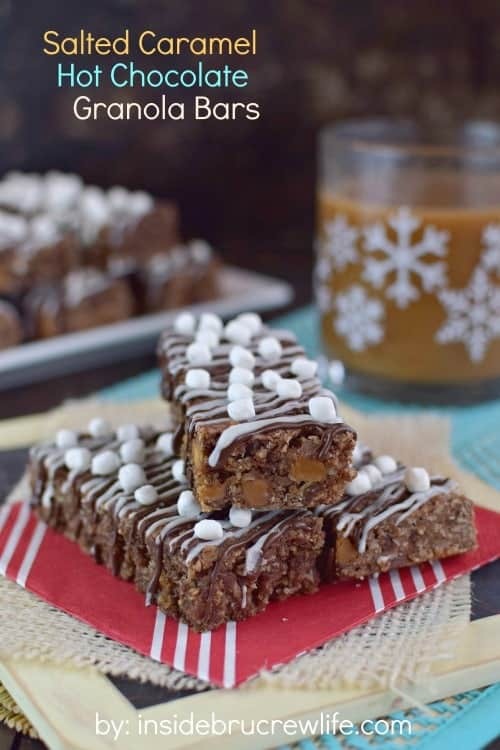 These easy to make granola bars have a delicious caramel and hot chocolate twist to them. 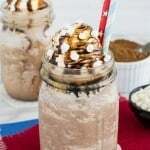 The extra chocolate drizzle, sea salt, and mini marshmallows give them that fun hot chocolate look. Beat the butter and sugar until creamy. Add the eggs, vanilla, and salt and beat again. Stir together the oats, flour, hot chocolate mix, and cocoa powder. Slowly add to the butter mixture until everything is mixed together. Stir in the mini chocolate chips and caramel bits. Spread the batter in a greased 9x13 baking dish. Bake at 350 degrees for 20-22 minutes. Cool. 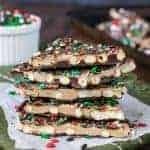 Cut into 16 bars and place on a parchment paper lined tray. 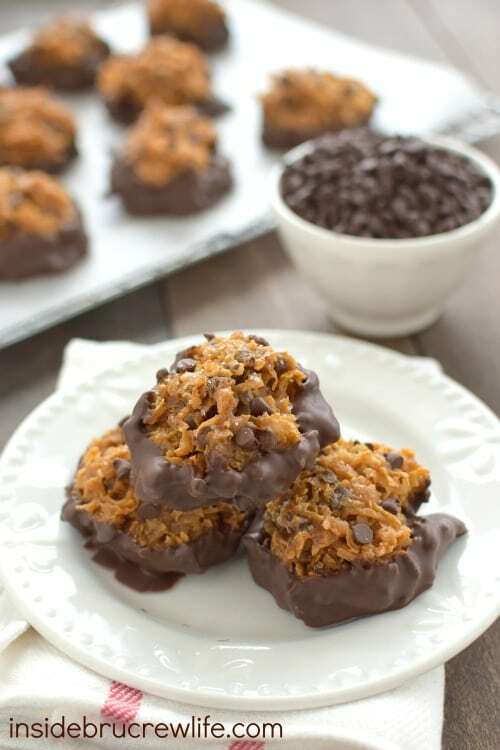 Place the chocolate chips and 1/2 teaspoon shortening in a microwave safe bowl. Heat for 1 minute. Stir until melted. Drizzle over the bars. Repeat with the white chocolate and remaining shortening. 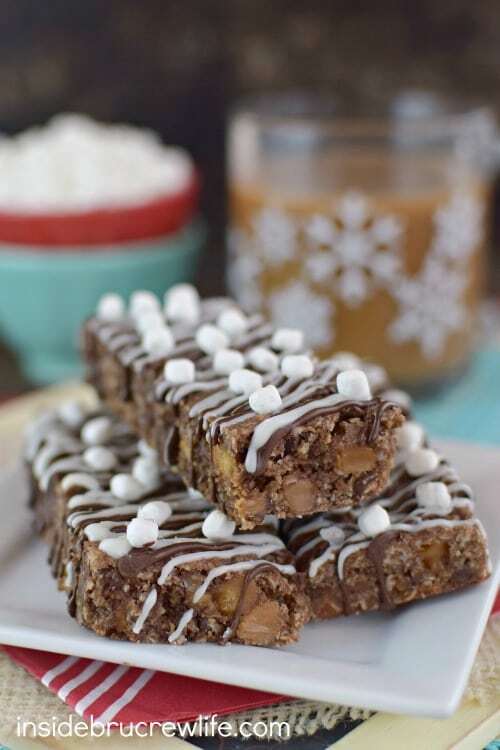 Sprinkle the tops of the bars with sea salt and mini marshmallows. Let set. Store in a sealed container. I am so with you. I don’t care if salted caramel goes completely out of style. I will still love it forever. This is a beautiful granola bar, not to mention amazingly genius! How fun are these?! Love!!! Now this is my kind of granola bar! I agree, I will always love salted caramel. And I will from now on, always want it in a hot chocolate granola bar! Pinning! You make the best salted caramel treats. I totally want to live with ya, just for these granola bars!! Breakfast just got a whole lot better if these are an option! My kids would flip for these granola bars!! Poor things are always getting the packaged kind in my house…I’m a bad mama. I don’t think I could ever get tired of salted caramel either, especially in these granola bars! I absolutely love this flavor, Jocelyn! Such a perfect treat for the winter. Pinned! My kids go through granola bars like there’s no tomorrow! 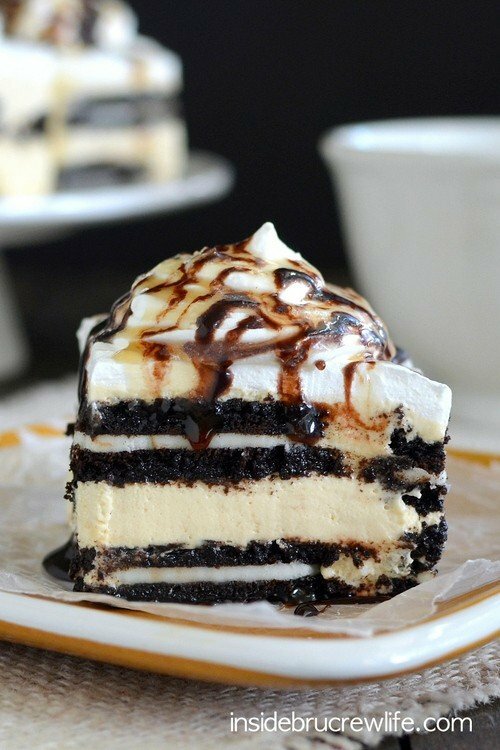 I need to try making some of these for them. Caramel and chocolate is my favorite, so yum! I can totally call these a healthy breakfast right?! 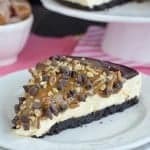 LOVE the combination of chocolate and salted caramel! I’ve still never made granola bars. How can that be?? Love these! Loving the salted caramel and hot chocolate combo with these! Delicious! These bars are so perfect!! You are so talented at perfect drizzles and cuts! Haha! I love the combo of flavors here! I will never be over salted caramel either. These look awesome! I’ve been looking for a homemade granola bar recipe forever – totally trying this! I am not sure these would last very long in my house! Yum! Chocolate, caramel, marshmallows. Yep, these look fantastic! You really cannot go wrong with salted Carmel! These look really tasty- I love the cute little marshmallows! Oh my gosh the blow dryer trick is genius. 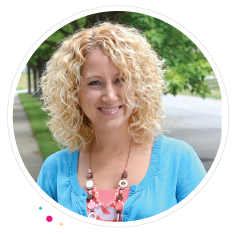 We food bloggers are already a little crazy, I don’t think our families would even notice! 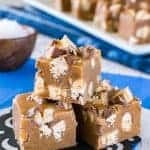 Salted caramel is one trend I have fallen head over heels for and anytime I can get it in for breakfast or snack, I’m in! These bars are perfect for grabbing and snacking (hello midnight 🙂 ) – those mini marshmallows are perfection! This looks like an awesome breakfast! Can’t wait to give it a try! I so love the flavor of hot chocolate in baked goods. It always taste amazing! Oooh I am so with you on the salted caramel thing. That food trend will never die, at least in my mind! I am so in love with this twist on granola bars too! Pinned! Salted caramel paired with hot chocolate?? Now THAT is a flavor combo I have to try!! Pinned! Since these are granola bars that means they are healthy right? 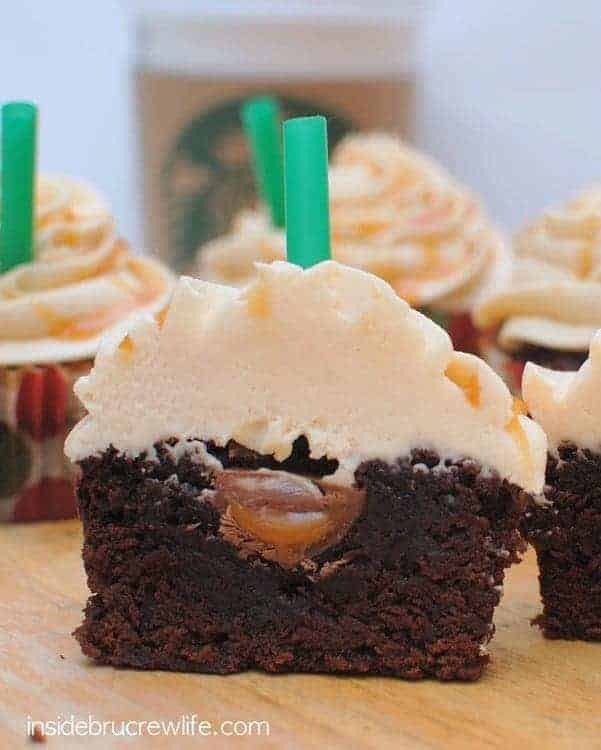 And salted caramel and hot chocolate flavored? These sound like perfection! Love the blow dryer tip!! Need to remember that next time I’m working with chocolate! I completely agree about salted caramel – I didn’t think I would like it, then I tried it, died and went to heaven. Loving these bars – granola is so versatile! 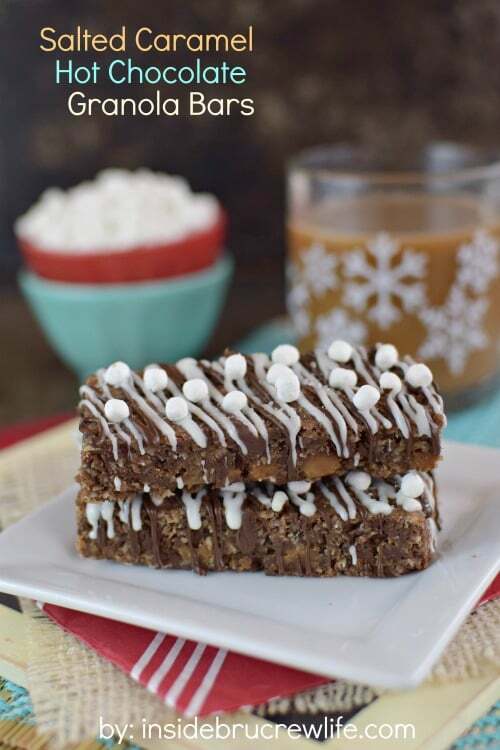 Wow, these salted caramel hot chocolate granola bars looked gorgeous. It is very decadent, and the people in my office are happy today! Thx for sharing!